The NFL has opposed the citizen voters of New Jersey in their desire for legal sports gambling while placing a team in Las Vegas and heartily endorsing daily fantasy sports. NFL witch-hunt styled investigations with the purpose of reinforcing unilateral disciplinary power while bowing to the whims of owners and/or perceived public opinion. The pursuit of taxpayer funded stadiums which has resulted in relocation of franchises and disenfranchisement of entire fan bases. Ever-increasing ticket prices and personal seat licenses which places live game attendance and season-ticket holder status increasingly out of financial reach of many fans. I could fill an article with various bullet points that demonstrate the NFL’s version of integrity but no where is the behavior more egregious and despicable than in its treatment of all but a select few retirees. While a torturous disability qualification process has existed for many years, drifting in and out of the public eye and congressional interest, the much heralded, uncapped concussion settlement, estimated at $1 billion dollars is at best a slap-in-the face, and at worst a death sentence to the players whose labor built the $14 billion league. In December 2016 the Supreme Court declined to hear an appeal which objected to the concussion settlement which was amended in 2014 and accepted by the lower courts, kicking off a registration period for benefits which ran through August 7, 2017. Widespread efforts were made to recruit enrollment for settlement benefits, warning retired players that if they failed to register they would be forever unable to file a claim. According to a New York Times article, Co-Lead Class Counsel Chris Seeger stated, “players with diseases that have already been diagnosed should receive checks within weeks after filing their paperwork.” This was indeed the mantra touted by both Chris Seeger and the NFL throughout the registration period. Players who had existing diagnoses for ALS, Parkinson’s Disease, Alzheimer’s, and dementia were led to believe that once their claims were filed checks would be issued in a short time frame. What Seeger failed to inform the players was that it would take in most cases about 36 weeks or nine months for approval for the lucky few whose diagnoses made it past the scrutiny of an over zealous claims administrator and didn’t wind up the subject of an audit or NFL appeal. Players were never informed that additional “fraud prevention” language was added to the settlement when it became uncapped that would give the NFL infinite ability to delay and appeal claims; instead they were sold on a process that was so simple they didn’t even need an attorney and so unlike the disability nightmare, they had no reason for worry. And Claims Administrator Orran Brown specifically stated in a “sign-up” webinar that the process would be quick. Watch the video below, courtesy of @PlayerJustice and listen to the pitch. “We are pleased the concussion settlement is proceeding as the parties and the court intended,” said NFL spokesman Brian McCarthy in a recent New York Times article that described how Mike Webster, the first NFL player posthumously diagnosed with CTE was blocked from the settlement along with Terry Long and Justin Strzelczyk, two other players who were diagnosed prior to 2006 which is one of the cut off dates for death with CTE claims with the other cut-off being July 7, 2014. The settlement does not cover CTE symptoms and the only death with CTE claims that are considered “valid” according to the settlement are those which occurred in the defined 7 ½ year time span. The chart below is from the January 16, 2018 claims report which indicates that 2,013 claims have been filed. Approved claim totals are shown in the first grid and those which have actually been paid are shown in the second. As you can see, approved claims are sitting at approximately 10% with claims actually paid at under 5% of those filed to date. The following table illustrates deductions from these awards. As you will note from the table above, the largest chunk of deductions come by way of “offsets” – NFL imposed conditions such a having a stroke prior to the qualifying condition’s diagnosis, which can reduce a claim by up to 75%. 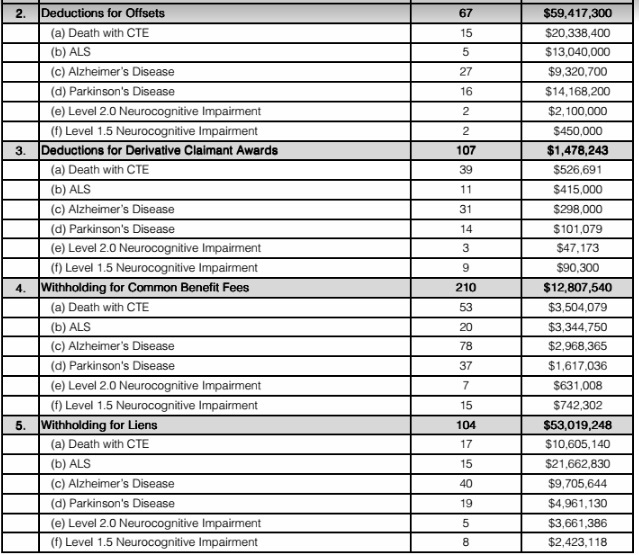 In looking at approved Death with CTE claims, the total in the first table is $70,608,267, but when adding up the deductions in the second table you see that $34,974,310 was deducted for liens, offsets and other deductions leaving a net of $35,633,957. Dividing by 53 for the total number of approved claims, the average payout comes to $672,338. While this is a substantial sum, it hardly replaces a lost loved one, and doesn’t resemble what class members were led to believe they would receive based on the chart below. In any event, regardless of diagnosis, the numbers depicted in the chart above – those sold to the class of impaired players and the general public look a lot different than the amount of compensation players are actually receiving. Perhaps the most troubling aspect in examination of the claims picture is that the over 35% of approved claims fall under the “easier” approval process for Death with CTE and ALS, but this certainly doesn’t represent 35% of claims filed. Most of the claims in this category for the existing population of retired players are already filed and in process. What this means is that the 5% of claims filed for these categories represent 35% of approved awards. And while every single player suffering from the horrific destruction of ALS deserves priority and every widow who has lost her husband to the devastation of CTE can never be fully compensated for her loss, the other 95% of players who are afflicted with Parkinson’s Disease, Alzheimer’s, or dementia deserve much better. Sobering figures are entered in support of this claim. Nearly 50% of the publicly reported CTE deceased (29% class claims) cases have been processed or are in process. 80% of eligible ALS (25% of class claims) cases have been processed or are in process. What this means, as pointed out earlier, the easier claims are either processed or in process, leaving other diagnoses at the mercy (or more appropriately lack of mercy) of the ruthless scrutiny of the NFL. Attorneys have indicated to me that they believe the NFL attorneys have a neurologist examining claims with them looking for any hole or technicality they can use to delay or deny payment of a claim. It’s not a process that seeks legitimacy, but one grounded in denial if there is any possible loophole that can be exploited. 19% discount implies these offsets are for young veteran players, with older retirees taking an even larger hit. 28% of the Death w/ CTE claimants are unlikely to receive any remuneration. 25% of ALS claimants are unlikely to receive any remuneration. 36% of Alzheimer’s claimants will receive an average $240K (approximately 3 years of care). 42% of Parkinson’s Disease (PD) claimants will receive less $50K (approximately 4 years of out of pocket costs for PD). Many class members still seem oblivious and even incredulous to the fact that CTE was excluded from the settlement. This was a masterful victory for the NFL and according to sources close to the claims process, medical records which indicate the possibility of CTE, are being used by the NFL in an attempt to discredit other diagnoses which would qualify a claimant for other conditions such as Alzheimer’s or dementia. As detailed previously only a few of the dead will qualify for a CTE award because of the small time window imposed for qualifying claims. Chris Seeger justifies this by claiming that the cutoff was designed to prevent more suicides by CTE sufferers. If this is actually the reason, it has been ineffective, as 20 percent of the completed suicides in the NFL’s 93 year history have been completed in the past 31 months – the time since the amended settlement agreement was adopted at which time CTE deaths became noncompensable. In reality, this was probably foresight on the part of the NFL since they undoubtedly realized that a very large population of players would be posthumously diagnosed regardless of whether their deaths were self-inflicted or otherwise. The results of a Boston University study in which 99% of the brains of former NFLers tested positive for CTE would tend to validate this assumption. While the study recognized that the brains donated represented a symptomatic representation of retired players, the Objectors’ report projects 1,500 cases at minimum with only 110 eligible to file a claim. 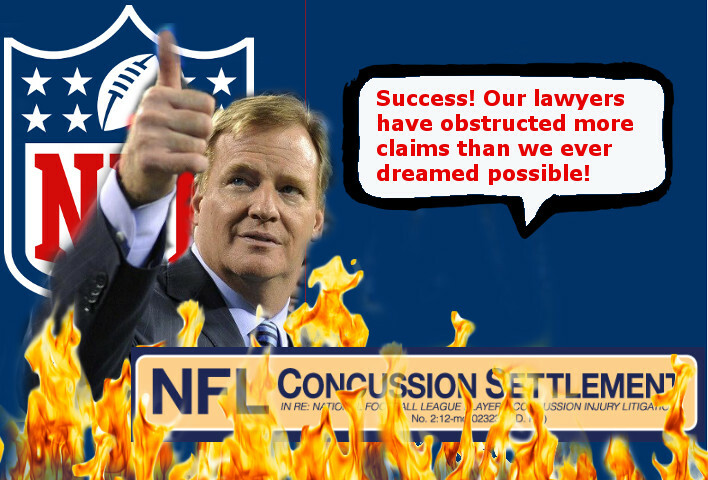 As one attorney in the case pointed out, the NFL’s attorneys are doing their jobs and doing them well. Chris Seeger’s narrative tends to change depending on his audience but many observers feel he sold out the class of retired players for $112.5 million in NFL money. The NFL has faced enough firestorms in Roger Goodell’s tenure as commissioner to kill most businesses but in spite of two years of steady TV ratings declines they have managed to remain the most prosperous sports entity in the United States. I firmly believe the reason for the decline is the lack of integrity shown in pretty much every issue across the board that doesn’t reek of a public PR pitch. Unless the league finds a way to put this in check, its lack of integrity will one day be its undoing. If they wish to halt the downward progression and restore some respect, they could start by calling off the bulldogs and taking care of the suffering men who built their fortunes.